ROME --- The first M-345 HET (High Efficiency Trainer) production basic/advanced trainer aircraft successfully performed its maiden flight at Venegono Superiore airport (Varese, Italy) today with pilots Quirino Bucci and Giacomo Iannelli onboard. 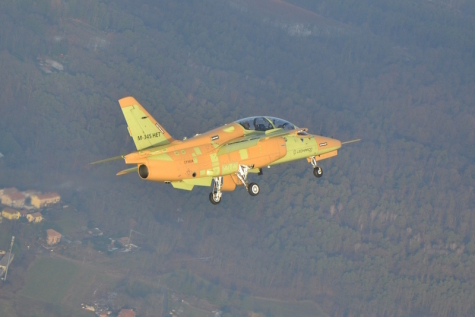 The new M-345 HET (High Efficiency Trainer) reduces the time required by Air Forces to train pilots. It also gives trainees the chance to fly an aircraft that features higher performance characteristics than other basic/advanced trainer aircraft currently in service around the world. The performance of the M-345 allows it to carry out the most demanding mission types found in a training syllabus, delivering high quality training at significantly lower cost. The M-345 is designed with a long life-cycle and an approach to maintenance based on just two levels, eliminating the need for expensive general overhauls. The aircraft’s Health and Monitoring Usage System (HUMS) also contributes to a lower cost of ownership. A sophisticated on-board training simulator confers a number of benefits. For instance, M-345 pilots are able to plan maneuvers before live training, allowing for higher efficiency during flight. Trainees are also able to fly in formation with other pilots in the air and on the ground in simulators, via a real-time data-link. The aircraft’s Mission Planning and Debriefing Station (MPDS) allows trainees to analyze the missions they have just flown. The M-345’s engine is a Williams FJ44-4M-34 turbofan optimized for military and aerobatic use. The cockpit is based on HOTAS (Hands-On-Throttle-And-Stick) controls and features a glass cockpit with a three-colour MFD (Multi-function Display) touch screen. The aircraft’s heads-up display is mirrored by a fourth screen in the rear seat.